In addition to Calcium's role in the formation of bones and tooth enamel, it also activates the enzymes inovolved in fat and protein digestion, in the production of energy, and is involved in blood clotting and the transmission of nerve impulses. Calcium also aids in the absorption of many nutients. An easy to digest powerful combination. The 2:1 ratio formula supplies a daily dose of 1000mg of Calclium and 500mg of Magnesium for maximum Calcium absorption potential. 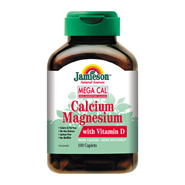 Added Vitamin D enhances Calcium absorption into the body.